The Perth Hills Tri Club committee are a dedicated and enthusiastic crew, freely giving of their time to create a community that you can be proud to belong to. If you have any ideas or constructive feedback for the committee please use the form below, anonymously if you prefer. If ever proof was needed that triathlon isn’t all work and no play then Travis is a great example. “As a coach I preach that you need to do your easy sessions easy so that you can do your hard sessions hard and I take the same philosophy in life generally. There’s a time to be serious but if you don’t relax and let your hair down when the opportunity arises the passion soon dies.” Unfortunately for Travis the days of having hair to let down are well behind him. Dedication. Whether you’re talking about his family, Ironman training, the club or the employees and clients at his veterinary practice in Mundaring this word would sum Ian up nicely. Known for telling it like it is with a gentle voice (honestly sometimes you can’t even tell if he’s praising or insulting you!) here is a man who knows exactly how to get things done. Before triathlon, Nikky’s idea of a good workout was running up her credit card at the post-Christmas sales. These days she has traded the stilettos for running shoes and party frocks for padded shorts. 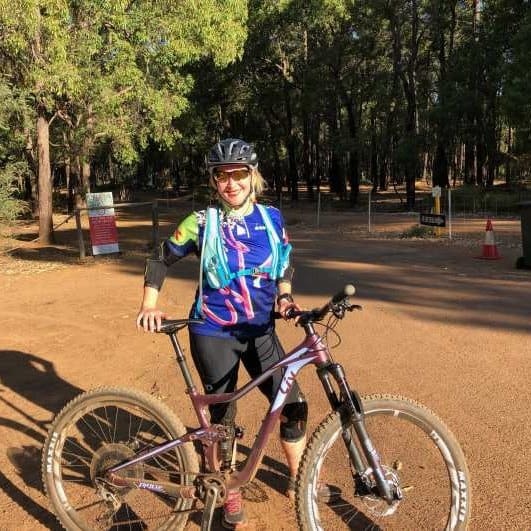 In addition to triathlon, Nikky loves trail running and mountain biking which she tries to squeeze in between being a mum to two junior triathletes and her day job as a HR manager. His other interests include trail running, eating and sleeping. Karen is evidence that training and passion are the key to being a real triathlete. She joined the club a couple of years ago and quietly trained and completed two seasons of enticers. This year the has set her sights on her first 70.3 race. A qualified accountant, she thought for a brief moment that she wanted to be a teacher. But after one year as a high school teacher she decided it might be easier to do an Ironman and promptly went back to being an accountant. Justine is a self-proclaimed chatterbox who loves triathlon because she’s made so many awesome friends since she started as a novice three years ago. She is a FIFO worker who disappears every second week to a gold mine. Justine dreams of swimming at a race as she keeps missing out due to Bruce and Mother Nature, but she’s pleased her duathlon skills are improving!